The United States Mint has revealed the final unaudited sales total for the 2012 American Eagle San Francisco Two-Coin Silver Proof Set. The updated figure of 224,981 sets is more than 10% lower than the last indication of 251,302 sets from the online sales odometer. 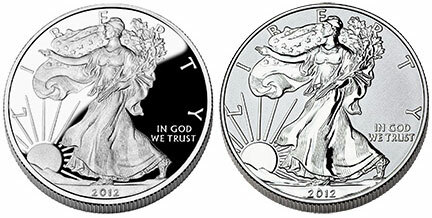 The 2012 San Francisco Silver Eagle Set containing proof and reverse proof Silver Eagles with the “S” mint mark was available for ordering only during a four week window from June 7, 2012 to July 5, 2012. Rather than assign a maximum product limit, the Mint indicated that the set would be minted to meet demand for the orders placed during the ordering window. Throughout the duration of the offering, a sales odometer on the online product page was updated daily with an indication of the total number of customer orders placed for the set. Within days, orders quickly surpassed 100,000 sets, but then settled into a slower pace of sales for most of the rest of the four week ordering period. The pace of sales jumped in the final days of availability, reaching 251,302 according to the final number posted on the sales odometer on July 6. The updated sales figure of 224,981 sets represents the “final unaudited sales.” It seems to have removed a large number of order cancellations and/or returns from the previous figure, however it still does not represent the final audited mintage. The US Mint can sometimes take years to release a final audited mintage figure for an offering. The reduction in the last reported sales may carry significance with some collectors. Importantly, the new total is below the final audited sales of 248,875 for the 2006 20th Anniversary Silver Eagle Set. This product contained proof and uncirculated coins with the “W” mint mark and a reverse proof with the “P” mint mark. The new total does remain well above the last reported sales of 100,000 sets for the 2011 25th Anniversary Silver Eagle Set. This product contained proof and uncirculated coins with the “W” mint mark, an uncirculated coin with the “S” mint mark, a reverse proof with the “P” mint mark, and one bullion coin. Shouldn’t it be “the new total remains well ABOVE the last reported sales of the 25th anniversary set”? See penultimate sentence. Yes, I have corrected that. Are there any updated totals for other sold-out coins, such as the uncirculated Lucy Hayes and Lucretia Garfield First Spouse?